LANCASTER, Pa., 2015-5-22 — /EPR Retail News/ — Auntie Anne’s, the world’s largest hand-rolled soft pretzel franchise, announced today the arrival of a new, limited-time only menu item to join its wide array of freshly-baked pretzel products. Available nationwide beginning May 18, Cheddar Stuffed Pretzel Nuggets offer the freshly baked taste of everyone’s favorite soft pretzel, filled with melted cheddar cheese in a convenient bite-size nugget. 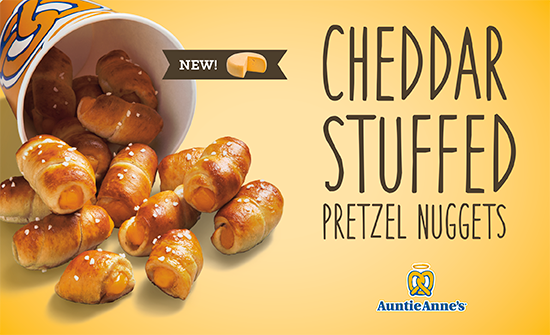 The new Cheddar Stuffed Pretzel Nuggets are a limited-time menu offering through December 2015 and like all Auntie Anne’s pretzels, are freshly baked all day long. The average price point of the new product will be $4.99 and will allow guests to satisfy cravings any time of the day while out shopping or traveling. The Cheddar Stuffed Pretzel Nuggets will mark the brand’s first new pretzel product to join the menu since the roll-out of Mini Pretzel Dogs in 2013. At its more than 1,500 locations around the world, Auntie Anne’s mixes, twists and bakes pretzels from scratch all day long in full view of guests. Auntie Anne’s can be found in malls, outlet centers, and Walmarts, as well as in non-traditional spaces including universities, airports, travel plazas, amusement parks, and military bases. In addition, it has extended the brand onto retailer’s shelves and also serves as a distributor for fundraising products. Available at select retailers nationwide, pretzel fans can enjoy Auntie Anne’s prepare-at-home products, from frozen Classic and Cinnamon Sugar Soft Pretzels and Pretzel Nuggets, to frozen Pretzel Dogs and Pretzel Pocket Sandwiches, to a versatile Pretzel Baking Kit. For more information, visit Auntie Anne’s website, Facebook page, Twitter or YouTube account. This entry was posted in Food & Beverage, Management, Marketing, Retail, Retailer and tagged Auntie Anne's, menu item, Soft Pretzel Heather Neary, the Cheddar Stuffed Pretzel Nuggets. Bookmark the permalink.